Upper material / colour: Suede – Blue / grey Cordura – as bell sample blue / grey. Yellow detail in embroidery, webbing, laces. Laces Black , Grey , yellow. 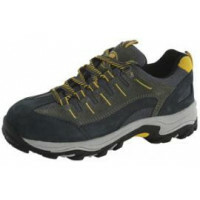 Outer sole : Rubber - Black / grey - yellow shank part. Eva mid sole : light rey as sample low cut. EN 20345 SB, Size: 35-48.